Like little boats, the Rose Flower shaped Floating LED candle floats because of the way they are made. They're flat on the bottom and not too thick, so they won't tip or flip over. This candle helps you create a romantic and relaxing atmosphere. Rose Candles add on to the basket of flowers. 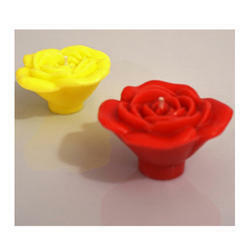 These tulip and rose candles are available in red, yellow, white and many more colors. These are the perfect choice to decorate for any occasion. Sizes- S, L, 2 SET. We are offering our clients an excellent quality range of Plain Rose Candles. These are made from high quality of raw material which ensure durability at its user end. These products are available in market at most affordable rates. Creating a rage in the market is our highly appealing Rose Candles. Designed in the form of rose, our Rose Candles have received high appreciation by the clients. We provide the Rose Candles in diverse colors and size to suit the client’s interest. Designed with perfection, our Rose Candles add on the ambiance of any place. With a firm commitment to quality, our organization is engaged in offering a wide ambit of Floating Candles. Rose perfumed rose shaped floating candles. 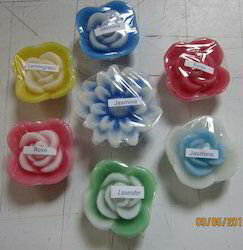 We are listed to be one of the noteworthy names for this impeccable selection of Rose Candle at very affordable rates.